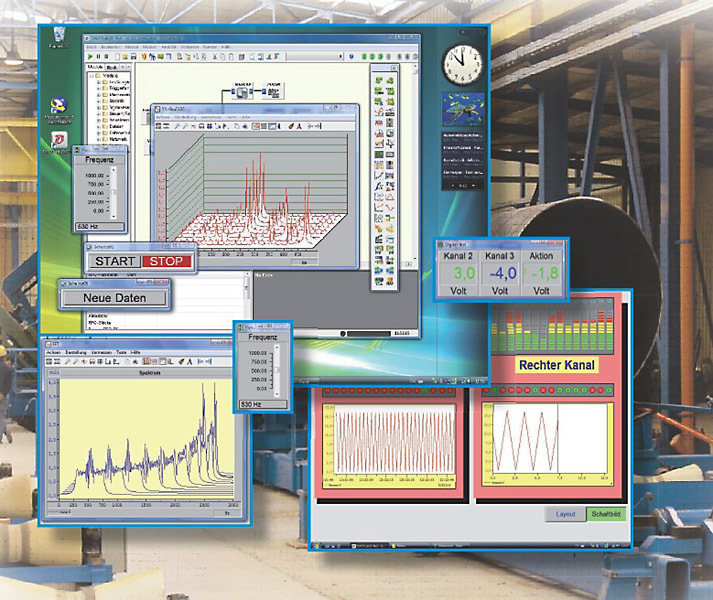 A new version of DASYLab, the point-and-click data acquisition and control software from measX GmbH & Co (Mönchengladbach, Germany) is now available in the UK from Adept Scientific (Letchworth, Herts). DASYLab’s function block interface makes it easy to set up and control measurement data applications in a standard PC Windows environment without programming; and new DASYLab 13 sees a significant upgrade in capability and flexibility by allowing users to define their own custom functions to add to DASYLab’s extensive library of drag-and-drop modules. With this new version, DASYLab becomes almost infinitely expandable. It’s simple to create your own individually defined, custom function module using the open-source Python™ scripting environment (version 2.65). Using this new Scripting module, it’s easy to write a custom computation, create a driver to communicate with hardware and software, or configure module and channel parameters. For example, you could create a custom temperature scaling module that takes one temperature input and outputs the temperature data in three different units. Setting up and controlling a data acquisition application with DASYLab eliminates hours of coding. DASYLab is designed for those who want to get down to work straight away, without having to write programs. Its simple, point-and-click interface lets you set up powerful, sophisticated data acquisition routines quickly and easily. With DASYLab you can create your own individual measurement or analysis application in a few minutes. From research and analysis to large-scale production and quality control, DASYLab is the software of choice for creating flexible and powerful monitoring and control applications, fast. A new Resample module lets you transform data from a time axis on an angle axis in order to analyse measurement data from rotating systems; this module converts vibrations on a concentric axis to the rotation angle. A welcome output addition to the Write Data module is to .csv (comma-separated values) text file, using the new ASCII (CSV Preset) file format available in the module. The new IVI Scope Module lets you continuously display data from external devices which support the IVI Scope instrument class. IVI modules now also display error codes and descriptions generated by the hardware driver. The new NI-XNET driver module lets you acquire and output data with National Instruments NI-XNET hardware, which supports the controller area network (CAN) and local interconnect network (LIN) bus systems. A number of new options have been added to various existing modules, for example a real timestamp is now available in the Average module and there’s a new re-trigger option to the Combi Trigger module. Compatible with data acquisition hardware from most manufacturers, DASYLab lets you focus on your particular area of expertise, while tapping into the power of the display, analysis and control features needed to fully process measurement data. Its flexible configuration of user interface and displays, interactive tutorial and more than 150 examples help you quickly set up and develop your application. This latest version combines powerful functionality, flexibility and ease of use for PC measurement and control. DASYLab 13 for Windows is available now from Adept Scientific in the UK. For versions and prices see www.adeptscience.com.